Salem State University apologized Saturday after someone apparently hacked the school’s Twitter account and posted a series of racist tweets hours before the Massachusetts school held its graduation ceremonies. Boston 25 News reports that late Friday night, Salem State’s Twitter account sent out a series of tweets for approximately two hours. The racially tinged posts lauded Donald Trump and white working Americans while deriding Black Lives Matter, minorities and immigrants. The images were deleted, but as we all know, nothing completely disappears from the internet. 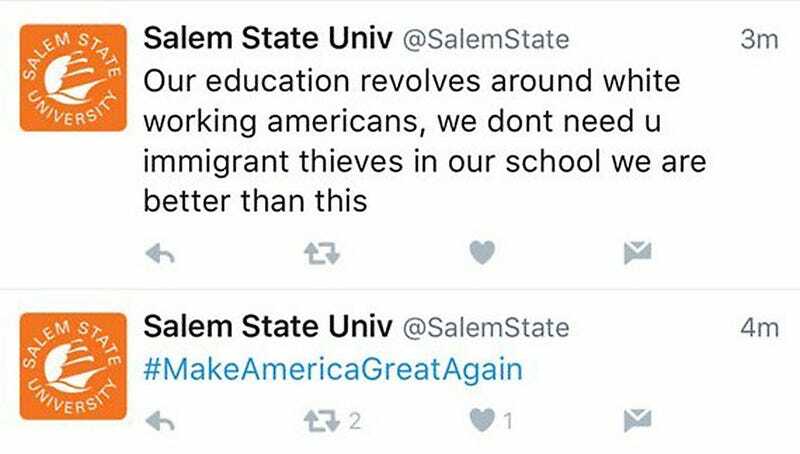 We are appalled by the hateful nature of these tweets, which in no way represent the views of Salem State University. We have notified our social media followers of this compromise and are working with IT to implement additional security safeguards. It is incredibly unfortunate that such a hateful incident occurred on the eve of our commencement, and we hope to move forward as a community and not let it detract attention from the incredible accomplishments of more than 1,400 students graduating today. Salem State University is a public college. Of the college’s 7,499 undergraduates, 8.6 percent are black, 11.6 percent are Hispanic, 4.2 percent are resident aliens and 67.8 percent are white, according to College Factual. See how “great again” America is becoming? Read more at Boston 25 News.